Eltronicschool. - This is one of easy use and freely electronic circuit design software called with ZenitPCB for Windows system. With this software you can design electronic circuit using various component provided. In this time, beside we will give you briefly description about this ZenitPCB, we also we will give you this software download freely from formal site that provide this ZenitPCB download easily and freely. FromListoffreware describe that ZenitPCB is software which give you a free to use circuit design. Using ZenitPCB software you can design electronic circuits with various circuit components provided. Firstly you can create a new design sheet as begin designing an electronic circuit. Then you will look a black colored board with grid appears where you can place your components. Right click on the board using your mouse to add Parts, Wire, Signal Ref, Global Net, and Text. Then please click on the Parts option to open a library of parts. 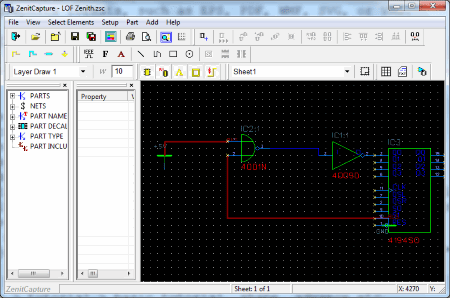 Now you will find different Diodes and ICs who you can select a part and click on the place to apply it on the board. Next, click on a placed component to view its properties in the panel available on the left side of the screen. Now you can go to View>ERC (Electrical Rule Check) to check if there's no error in the circuit design after you have designed your circuit. Please save your project in .ZSC format and you can printout of the circuit can be taken if you want. A report of the project can also be exported in TXT format. This report includes Project name, Author, Number of Parts, Pin count, etc. A User's guide is available in PDF format in the Help menu. And now you can click the link below to take free download ZenitPCB to Design Electronic Circuit Easy and Freely from formal site.